On Monday, Alex had his 3 year check up with his pediatrician. He usually doesn't want to cooperate when we go to the doctor, but this time, since he's such a 'big boy', he did. He climbed up on the exam table & did exactly what the nurse asked of him. He let her check his blood pressure and listen to his heartbeat. He took an eye test & passed with flying colors. As for size, well he's still a big boy. He's 3 feet 4 inches tall and in the 95th percentile for height. Dr. Byrd said he's as tall as an average 4 year old! And he weighs 35lbs and is in the 40th percentile for weight. So he's a tall skinny boy, which we already knew. And luckily, he didn't have to get any shots! So overall, he had a great checkup. While there, I also talked to Dr. Byrd about something that has been going on with Alex for the past couple of weeks. We think that he is hypoglycemic. One day each week for the past 3 weeks, Alex has thrown up in the morning. He is lethargic, grumpy and says his stomach hurts, but doesn't have fever or any other symptoms. But once he gets some food in his stomach, he seems to feel better. (Fish sticks seem to be the magic food, lol!) The first week I thought it was a stomach bug, the second week it was weird, maybe a coincidence or maybe he hadn't gotten over that stomach bug. But the third week it was just too much of a coincidence, so I did some Google research. And that is how I came up with hypoglycemia. All the symptoms seem to fit, especially the extreme irritability. So I talked to Dr. Byrd about it & he seemed to think it fit too. There is no need to test though unless it gets extremely bad because all we need to do to control it is to feed him. (Not that we were starving him, lol!) He doesn't like to eat in the morning when he gets up (and neither do I) but I have been forcing him to. And that's really all we have to do, just make sure he eats something as soon as he wakes up. And since we've been doing that, there has been no more throwing up! Yay! So hopefully we won't have anymore problems with the hypoglycemia & other than that, Alex is a happy & healthy sweet little boy! I love him so much & I'm so glad that he's mine! Last last Friday night (April 13th), Aunt Susan hosted an all girl's slumber party. It was just for us all to take some time to get together & also to celebrate my mom's birthday. Susan cooked us a delicious Italian dinner. This is what happens when you hang out with a tween, lol! The brownie trifle for Mom's birthday. I got her a windchime for her birthday. I really had such a great time hanging out with my sisters, my mom, my Aunt Susan, and my nieces. It's really HARD for me to drop everthing & leave my little family but I'm so glad that I did. Sometimes a small break does wonders, even when you don't realize that you need one. Thank you Aunt Susan for hosting the slumber party. I love you & can't wait for the next one! We all had a lot going on before Easter, so we decided to have our playdate Easter egg hunt on the Wednesday after Easter. Which I'm sure the kids loved because it keep the Easter festivities going! We met at the soccer fields & playground in the back of Sienna & we all brought a couple dozen eggs. It's funny to watch the kids hunt eggs at this age. It's not about how many you find, it's about what's inside. They would all find an egg & then open it to see what was in it. If it was candy, it HAD to be eaten before looking for another egg. And they get easily distracted. Alex found this really big stick, which was so much cooler than plastic Easter eggs! Alex checking out his stash: a car, a sticker & fruit snacks. Score!!! Alex crawled inside of the tunnel on the playground to get out of the sun. There were a lot of mosquitos and it got real hot real fast, so we didn't play for long after the egg hunt. But that's ok because I'm sure all the kiddos still had lots of fun hunting eggs & eating the candy inside them! On Easter morning, the kids woke up and found that the Easter bunny had hopped by. Addy's Easter basket was filled with bubbles, sidewalk chalk, stickers, balloons, paint, a stuffed bunny, cookies & candy. Addy loved everything she got. Thank you Easter bunny! Alex's Easter basket contained candy, silly straws, paint, bubbles, sidewalk chalk, balloons, & more candy! Luckily, the Easter bunny brought Alex just what he wanted, a big chocolate bunny! Addy was very sweet and let Alex paint some of the ceramic animals that she got in her Easter basket. Wayne & Tracey came over to Pat & Eddie's to celebrate and Pat cooked a great big delicious lunch. After lunch, it was time for the big event... The much awaited (by the kids that is) Easter egg hunt! Look at all the eggs Addy found! Some of the eggs had confetti in them and Alex LOVED it! And Addy had fun playing with the eggs & grass, pretending it was a bird's nest. Shortly after the egg hunt, it was time to pack up and head home. We had a great Easter weekend in Beaumont! After we left CiCi & PopPop's on Saturday, we went to MawMaw & Granddaddy's house and decorated Easter eggs. Addy painted a few eggs. And then she made Mawmaw go get the blow dryer so she could dry her eggs. Genius, I swear! 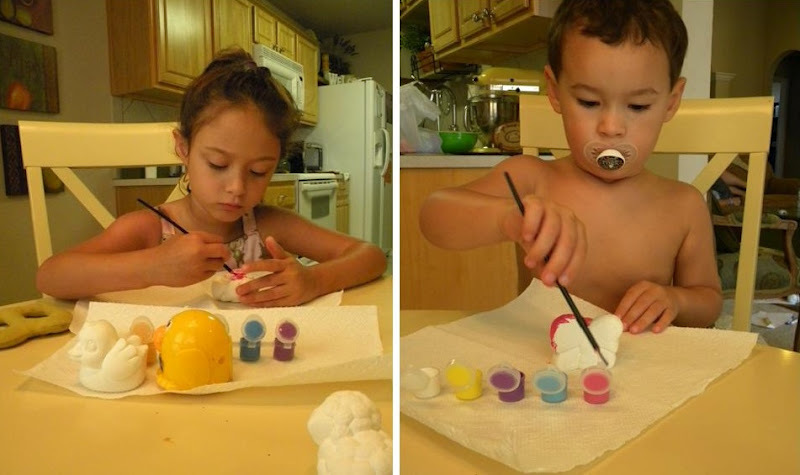 Alex started painting his eggs with a little bitty paint roller. But then he decided finger painting is much more fun! Dirty dirty hands = lots and lots of fun! And of course, we dyed some eggs too! Look how pretty they turned out! When we were all done decorating the eggs, Addy picked these 5 for an egg hunt. And of course, Alex had to get in on the action & found a few himself. On Sunday, Mawmaw & Granddaddy hid the rest of the eggs in the backyard for a big Easter egg hunt with Jules & Grant. Stay tuned for my Easter Weekend - Part 3 post to see more about that.